Does Your Baby Have a Flat Head? Deaths from SIDS have decreased. Putting babies to sleep on their backs significantly reduces the risk of SIDS. The rate of babies with "flat heads" has increased. In medical terms, it's called positional brachycephaly and while it's not necessarily dangerous, it does sometimes require treatment. Here's what you need to know if you suspect your baby has a flat head. The American Academy of Pediatrics (AAP) explains that flat head syndrome, also sometimes called cranial asymmetry, which means the head is not symmetrical, is usually not medically worrisome and often temporary. The most common issue with flat head syndrome is making sure that your baby's head is flat because of positioning, and not a bigger medical condition, such as an actual deformity or underlying issue with the brain. 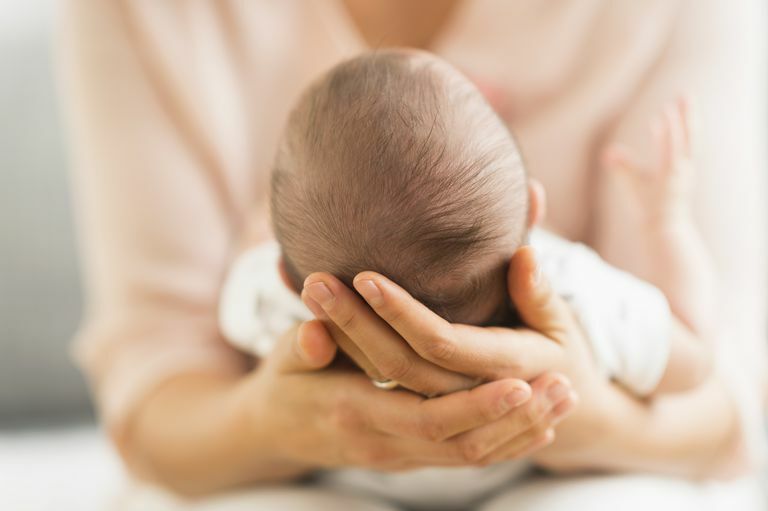 In some rare cases, for example, a skull condition might not be apparent until the baby is a few weeks or months old, so if you suspect your baby has a flat head, you will want to have him or her evaluated by a doctor. The AAP describes that although flat head syndrome usually is not super dangerous and it's easy to fix, there are some complications that can occur. If the flat head is caused by an underlying issue with the neck muscles, for example, that doesn't let your baby lift his/her head properly, your baby could get muscle damage or even develop bleeding in the muscle. And anytime your baby is left in one position for too long, it can create a vicious circle—his neck muscles won't develop properly enough to give him the strength to lift his head, so he will remain in that position, and the muscle could actually tighten and shorten permanently. The first thing your doctor will do if a flat head is suspected is checking your baby for any neurological or other physical abnormalities. If your baby is hitting developmental milestones properly and there are no other issues, in some cases, your baby's head shape may be fixed through simple positioning changes at home or on the go. If the condition is mild, allowing your baby to have more tummy time or carrying her in a carrier to allow her to have a "break" from resting on the back of her head, for example, may help to correct the flat head. In other cases, your doctor may prescribe a helmet for your baby to wear during the day and night to help the skull develop correctly. Change your baby's position frequently. Don't let her spend too much time in one spot. Even if you're at home, try to move your baby from the swing to the bouncer, or to the floor for instance. Be sure not to let him spend too much time sleeping in places that aren't his crib, such as the car seat, for example. Practice lots of supervised tummy time. Aim for at least twenty minutes a day, but the more the merrier, especially if you are concerned your baby may be developing a flat head. Try a baby carrier. Using a baby carrier that allows your baby to face in, towards your chest, can help take some of the pressure off your baby's head and work on strengthening those neck muscles all at the same time. Laughlin, J. (2011, June). Prevention and Management of Positional Skull Deformities in Infants. Pediatrics.